Being blocked on Twitter by Marc Andreessen has become a bragging right. The famed Silicon Valley investor appears likely to block people who think differently than he does -- and maybe pose a threat to the bubble of ideas that he wants to grow. Andreessen's impact on the tech sector began decades ago when he helped create Netscape. His venture capital fund Andreessen Horowitz has since led investments in many emerging fields, including cryptocurrency and virtual reality. He was among the earliest investors in Facebook (FB), and now sits on its board. His influence in the tech industry has gotten him quite a following on Twitter. Andreessen became very active in January 2014. Since then, he has tweeted more than 81,000 times, gained more than 457,000 followers, and follows more than 5,600 accounts. There were more than 1,700 tweets that contained "blocked by @pmarca" or "blocked by Andreessen" when CNNMoney looked last week. There's even a list that tracks people who say they've been blocked, with 201 accounts on it. All blocking on Twitter accomplishes is that blocked users can't see his tweets. So there are at least two accounts that replicate what he says: @pmarca_retweet and @rtpmarca. So why do people think they're getting blocked? @neeratanden @pmarca Marc is so thin skinned that he blocked me on Twitter for challenging him. Hilarious. Proud to report I've been blocked by Marc Andreessen (@pmarca ). Good idea! Shut out anyone who doubts your vision of technological #utopia! A month later, still wondering why was unfollowed AND blocked by @pmarca. 2 many Theranos/driverless car tweets? Missing the SV zeitgeist. CNNMoney asked data analyst Michael Alatortsev, head of iTrend, to look at the accounts that have apparently been blocked. Alatortsev created the "people blocked by @pmarca" list and is one of those people himself. "There's no obvious pattern. He does not discriminate," Alatortsev said. "It's all over the place." Many are tech journalists and writers with a lot of followers. There are investors, startup founders and entrepreneurs, people who work at large tech companies including Microsoft (MSFT) and Twitter (TWTR), and people who have vague bios and are fairly inactive on Twitter. A spokeswoman for Andreessen said he wasn't available for comment. Josh Felser, a tech investor, entrepreneur, and active Twitter user, says he has never noticed any bias in the way Andreessen blocks people. "Anyone on Twitter or Facebook has the right to curate their feed, and if there are people heckling, you have the right to kick [them] out," Felser told CNNMoney. "I don't think there's a deeper meaning." But Andreessen doesn't just kick out people who say nasty stuff to him, according to Alatortsev. Many haven't attacked Andreessen personally. Alatortsev said he was blocked after he tweeted about the hype over bitcoin, one focus of Andreessen's investments. He said the problem with Andreessen and other high-level venture capitalists blocking people on Twitter is that they stop seeing ideas that they disagree with. To avoid being blocked, many people stop disagreeing with Andreessen and others like him, Alatortsev believes. "They've lost honest feedback and that's affecting the Silicon Valley culture," he said. More than 90% of what Andreessen posts are retweets of other people. His Twitter handle also gets mentioned thousands of times a day. Benedict Evans, who works with Andreessen at Andreessen Horowitz, has recently been criticized about his blocking habits as well. On Wednesday, people on Twitter accused him of living in a Silicon Valley bubble and being out of touch. this vc is going to sit on the board of one or many companies. he will make decisions about the direction these companies will take. Evans defended himself in a series of followup tweets. I'ce always tried to engage with people criticising me. Mixed results. Will shift the block threshold in 2016. In 8 years I've blocked 3500 accounts. Many bots/spammers/#marketers, some lunatics, plenty of fanboys, at least half pseudonymous. Andreessen hasn't weighed in yet. But he has in the past shown delight over the interest of who he blocks. @VineetDevaiah @j3slyVarghese The key to success in life is being blocked by all the right people! 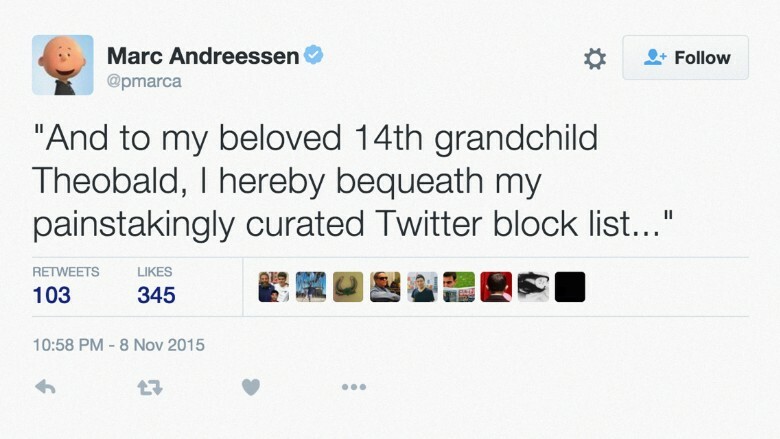 "And to my beloved 14th grandchild Theobald, I hereby bequeath my painstakingly curated Twitter block list..."